Everybody knows that the digital age is being defined by the perpetual source of free and readily available information that is empowering customers to make intelligent choices about the way in which they consume the right product for the right situation, in a manner that matches their individual learning style. In addition, the way in which organizations deliver education and learning is also being disrupted. Learning teams are unable to forecast the skills of the future and match the pace of change and demands from their internal and external customers. The shift to a Digital Age Learning (DAL) mindset requires learning organizations to put their end customers – employees, suppliers, vendors, contractors, and contingent workers – at the center of a personalized learning experience that can be delivered with both agility and speed. Capgemini University is on the front line of developing our people’s skills and capabilities to match a dynamic market. We leverage DAL principles to deliver an end-to-end, learner-centric experience to inspire our people to continuously develop in line with their professional growth aspirations. Engaging through an exceptional and relevant learning experience. Ubiquitous, just-in-time, on-demand, and in context. Balanced blend of experiential, social, informal, and formal approaches. Continuous, based on inquiry, exploring and doing. These principles have been the inspiration for Capgemini to design some truly effective, best-in-class learning solutions that have achieved tangible results. The start of the Capgemini DAL learning journey was at the heart of the learning organization – changing our learning professionals’ ways of operation. We discovered that our incumbent systems did not have the features necessary to provide a social and personalized learning ecosystem to support both the learning professionals and our new age learners. Capgemini University therefore set out to create a learning solution for the modern learner. Simplify the process of registering or accessing course information by integrating a Single Sign On (SSO) feature. Provide personalized learning path recommendations based on the learner’s pre-assessment results. Provide a device-agnostic solution that would promote ubiquitous learning. Deliver a wide variety of content types, including videos, podcasts, documents, courses, links, quick knowledge checks, etc., in a simplified and engaging way. Enable learners to access the learning material intuitively and effortlessly through a modern user interface. Offer social learning opportunities where learners could interact with each other and provide recursive feedback in the form of likes and comments. Provide an extremely agile way for administrators to access rapidly changing training materials quickly and effectively. Enable administrators to create customizable reports that gauge the effectiveness of a learning solution and helps edit the courseware to enhance the learner experience. Note: The images above show launch page and content page of the platform. As a flexible, yet structured platform for a variety of curated content. As an easily configurable via a Content Management System (CMS). For certifications with strict learner paths. To deliver virtual programs over a specific period of time. To roll out content in phases. To develop large courses that would benefit from personalized learning journeys for learners based on roles and current level of understanding, etc. For cohort-based courses, where detailed learner and content insights are helpful to make improvements for future runs. Note: The image above shows the platform CMS. In the short time the MOOC has been live, it has already been used to deliver four different knowledge areas and the pace of adoption is accelerating. 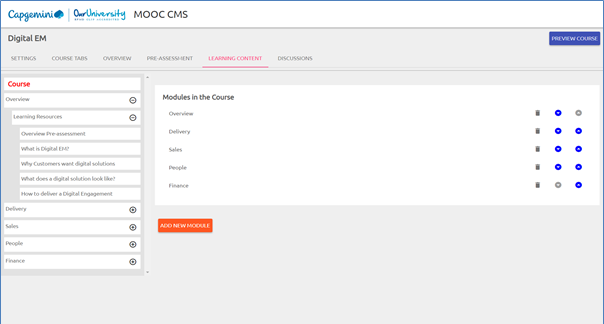 The MOOC has shown that with the way it is structured, it may soon be the tipping point that shifts the focus of Capgemini University from content development to content curation, making Capgemini’s learning and development function much faster and more agile. Significant improvement in the overall learner experience through ease of access, reduced learning hours for experienced learners, and social learning, among other smaller contributing factors. 6% improvement in learners’ average performance, and a deeper understanding of the subject matter that improves performance. Increased ease in customizing the application and short turn around time to embed curated content. More effective evaluation of the learning intervention has helped improve the performance of the learners. Increased adoption to build future courses, greatly increasing dissemination of information across the organization. Learners can experience a device-agnostic application. The platform serves as an excellent wrapper of curated content used in virtual program delivery. The platform captures micro actions to get a solid understanding of experience, consumption, and behavioral insights of a user. The platform is scalable and can allow new features to be easily implemented. Social interactions and ecosystem connect is extremely useful in taking the learning experience ahead. To date, Capgemini University has 5,200 unique users across five learning journeys, with an asset count of 25,000 across programs. Going beyond employment and corporation, it’s clear that the digital era requires individuals to be lifelong learners who can adapt their skills to remain relevant in the job market. It also requires people to be problem solvers with the ability to drive innovation across domains. Individuals need to be able to find and navigate information, and, perhaps more importantly, interpret that information, expressing their ideas effectively through digital media. Capgemini University leverages DAL principles at the heart of their designs to facilitate our employees’ learning journeys to suit their individual needs. The future of learning design has never more personalized and learner-centric than it is now. Shazia Joshi is the Design and Innovation lead of the DAL Lab at Capgemini University. She leads a team of 12 people that design and build virtual learning courses for the Capgemini Group. The team also constantly researches new learning trends and pilots them through different programs offered to business units.